A darn good Mega blaster. 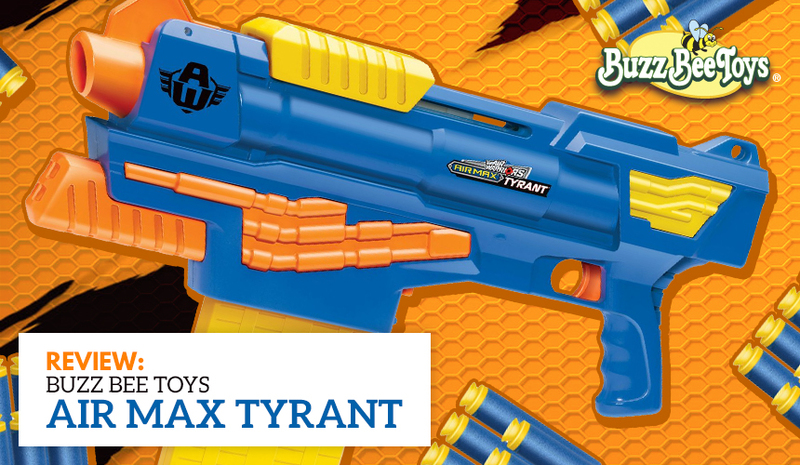 Part of Buzz Bee’s moves against Nerf’s dominance has been to get into the Mega business. 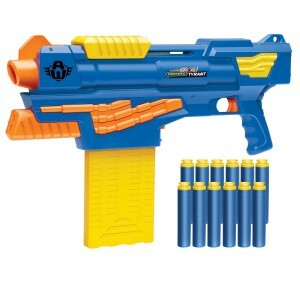 The one aspect of Mega blasting that Nerf has failed to impact on is clip (mag)-based Megas, since their only clip (mag) Mega, the Centurion, was heavily flawed on release. 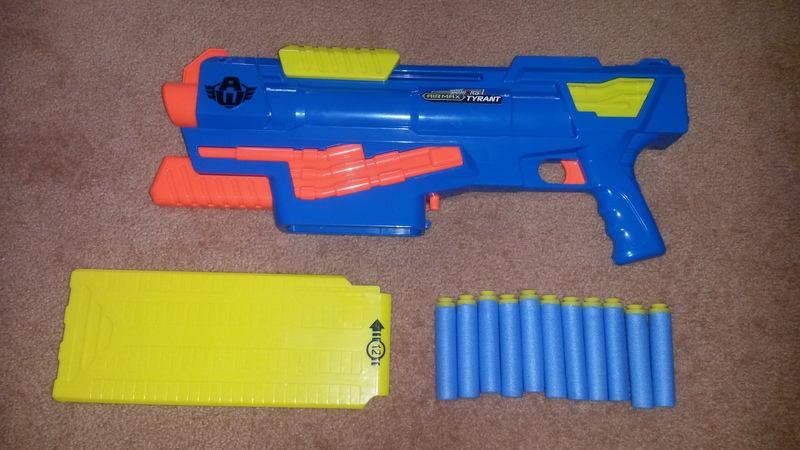 Buzz Bee has jumped into the Mega game led by their clip (mag) fed flagship, the Tyrant. 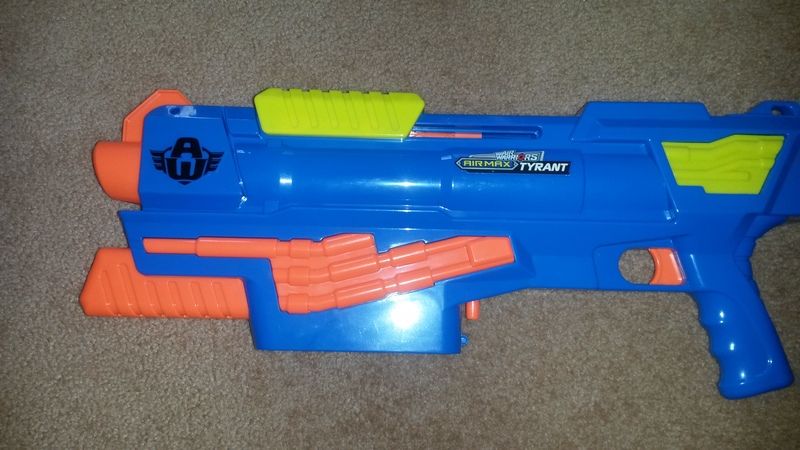 Coming with a 12 dart Mega clip (mag) and a range claim of 80ft, does the Tyrant have what it takes to challenge Nerf’s Megas? 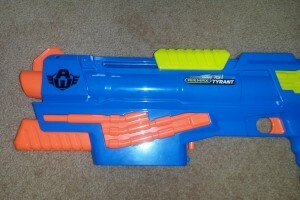 Disclosure: This particular blaster was sent to me by Buzz Bee Toys for review, so thanks to them for their contribution. 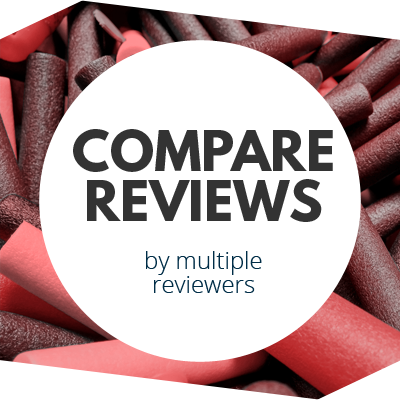 Note that their contribution will not bias the review. 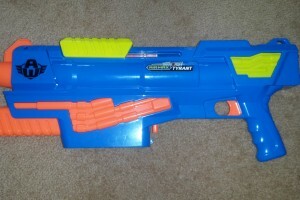 Left side of the Tyrant. 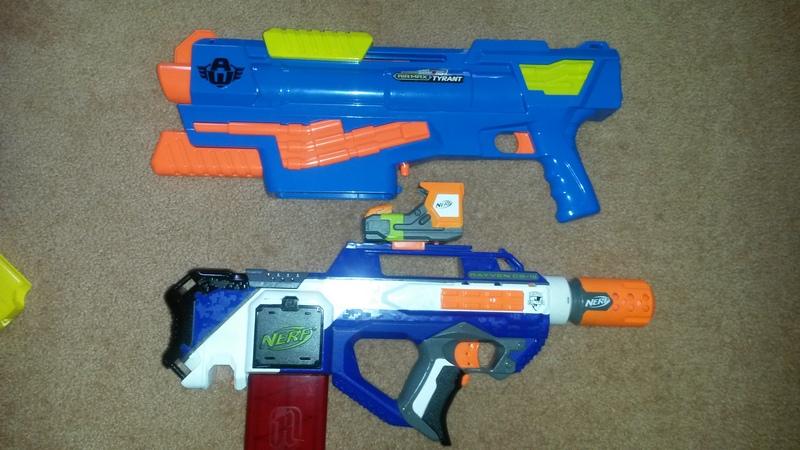 Size comparison next to my Elite Rayven. 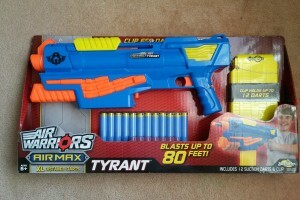 The Tyrant is a gargantuan blaster, considering it doesn’t have a stock or underbarrel pump action. 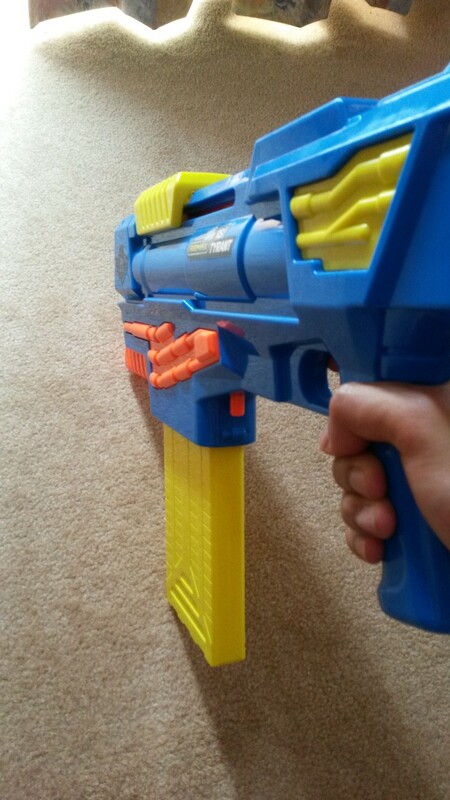 It’s about the same length as a Rayven with a Proximity Barrel, which is by no means short. 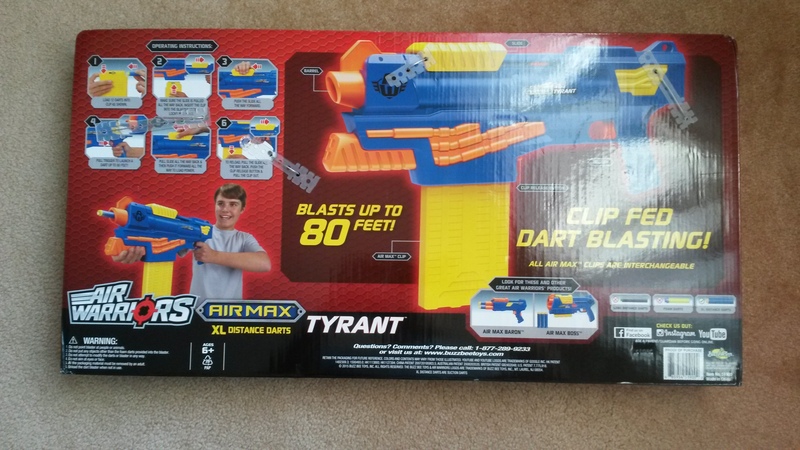 The significant bulk of the Tyrant is also noticeable next to the Rayven. 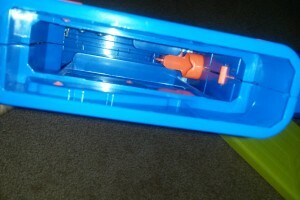 It also severly lacks detail, much of the shell is just smooth and boring. 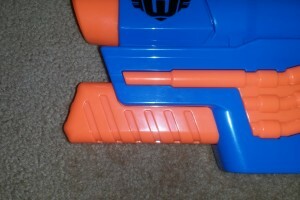 A look down the muzzle shows the simplicity of Buzz Bee’s design. The breech does not mate with any muzzle piece, rather it is just left floating. 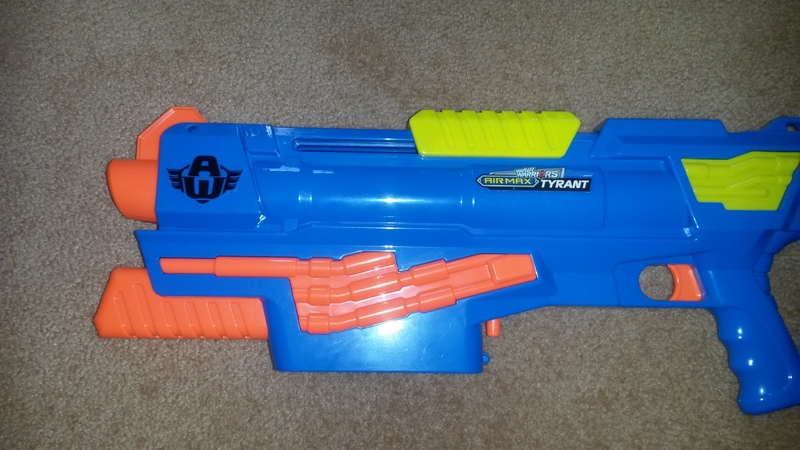 The fore-end of the Tyrant is quite small, it’s just a small orange piece that slots in to the front. 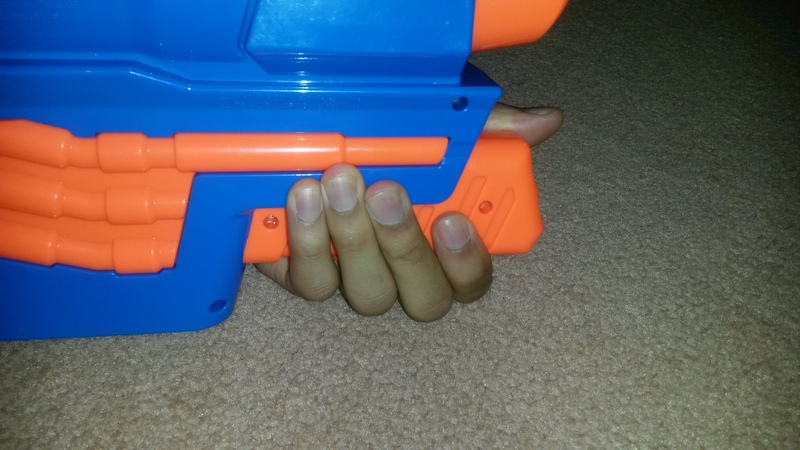 While not particularly comfortable, it works well enough. 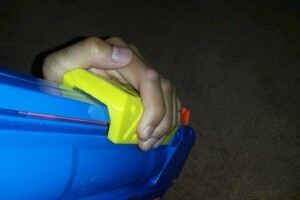 The handle I find quite comfortable as it is fairly well designed. 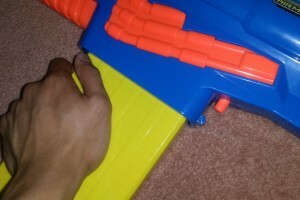 Since the handle is about regular sized, it feels quite small compared to the rest of the blaster. The slide is a very basic rectangular slab. Not a whole lot of thought has gone into designing it, but it works well enough. 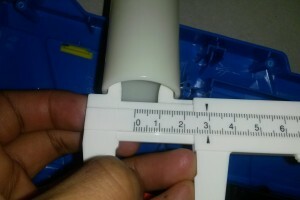 Thanks to its width, it is reasonably grippable. 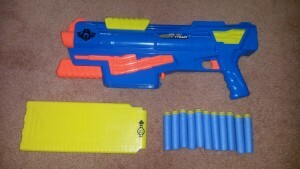 An underbarrel pump action would have been much preferred considering the size of the blaster. 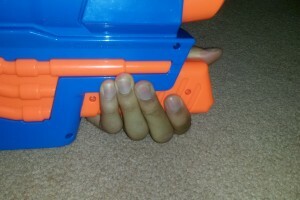 Reaching for the clip (mag) release. 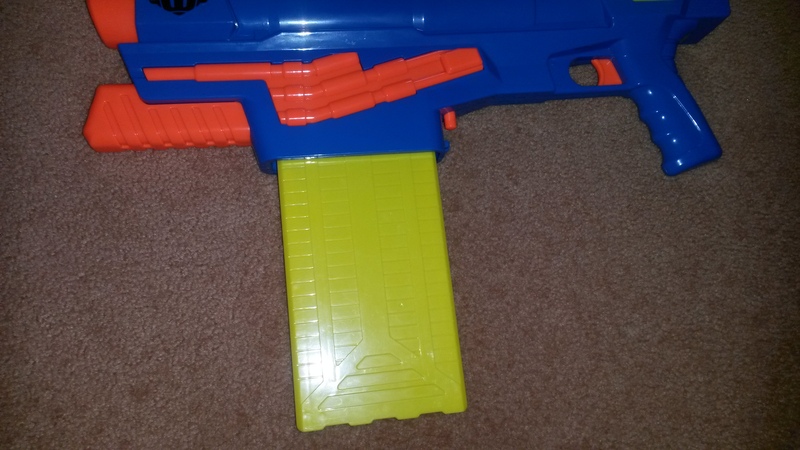 As expected for a Mega clip (mag) system blaster, the magwell is pretty big. 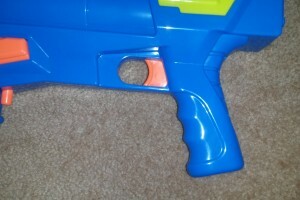 It uses the same clip (mag) release button as Buzz Bee’s other clip system blasters, a small vertical cylindrical button behind the magwell. 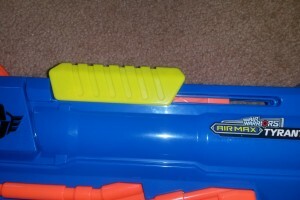 In the Tyrant’s case particularly this clip (mag) release position is quite awkward. 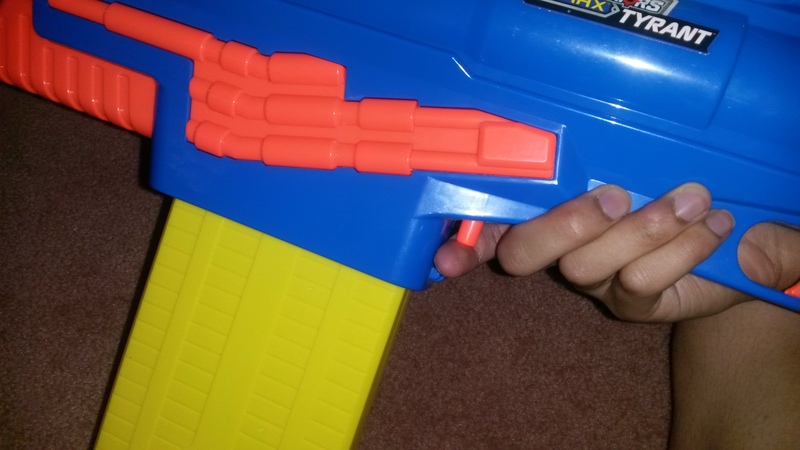 As can be seen in the third picture, my hand is completely dwarfed by the 12 dart mega clip (mag) and the blaster. 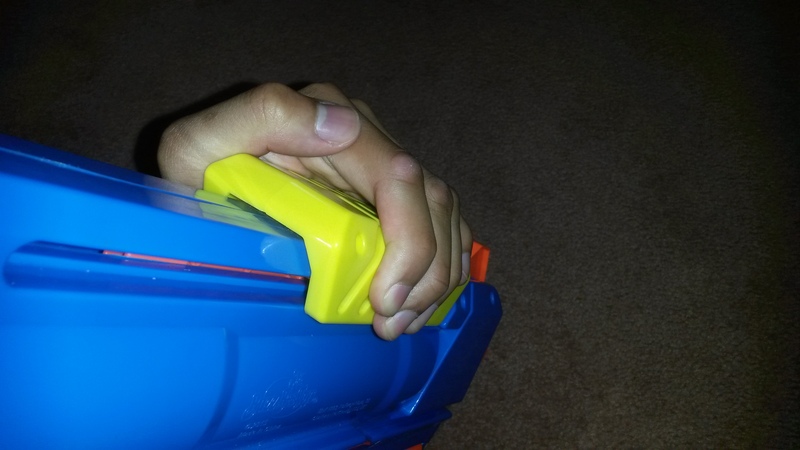 I can’t reach around the clip (mag) with my hand to actuate the clip (mag) release, instead having to shift my main hand. 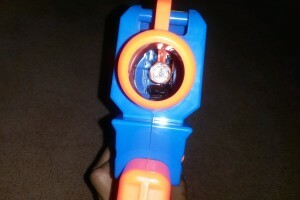 Regardless of how you actuate the clip (mag) release, it’s more awkward than with most blasters. Start of the firing sequence. 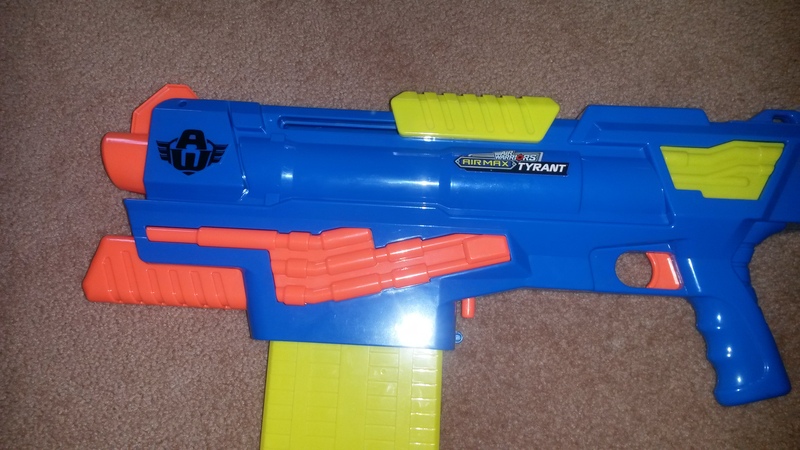 The priming/cycling sequence of the Tyrant is the same as most clip (mag) system blasters. 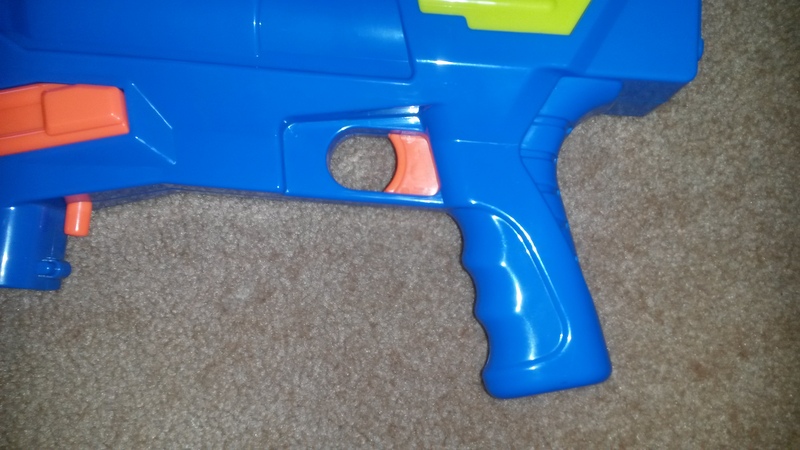 Pull the slide back to open the breech and prime, insert/replace a clip (mag), push the slide forward to chamber a dart, and pull the trigger to fire. 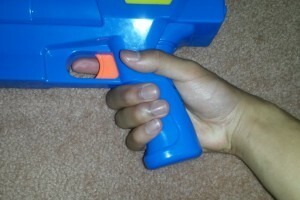 Naturally the trigger is locked unless the slide is forward, and once a dart is chambered, the slide is locked forward until fired. My unit seemed to have issues relating to the dart tooth. 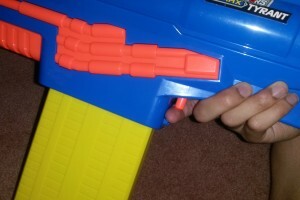 The dart tooth is a piece that pushes the dart into the breech, and then retracts for firing. However I was experiencing the dart tooth staying up too long, and thus interfering with the forward slide stroke. 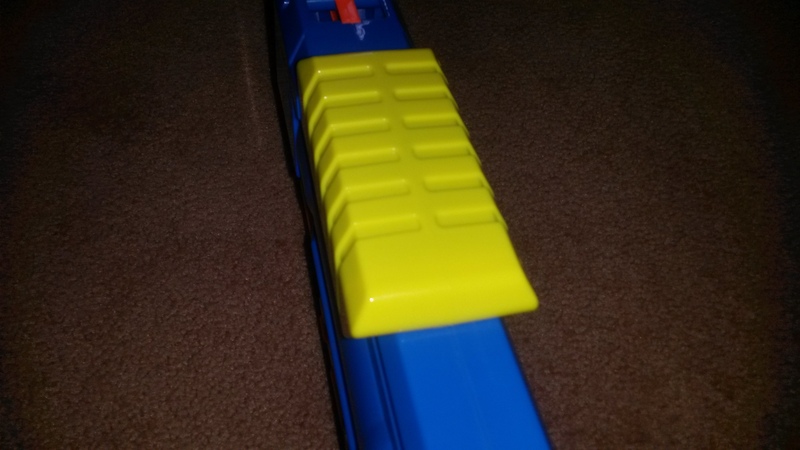 This reduced rate of fire since I had to ensure each forward stroke was strong and deliberate. I have managed to implement a fix for this problem, which makes the forward stroke much easier, thus improving ROF. 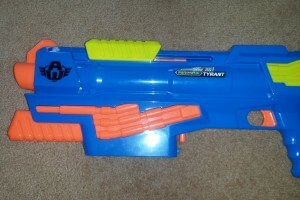 Outside of this dart tooth issue, though, the Tyrant works smoothly and quite well. 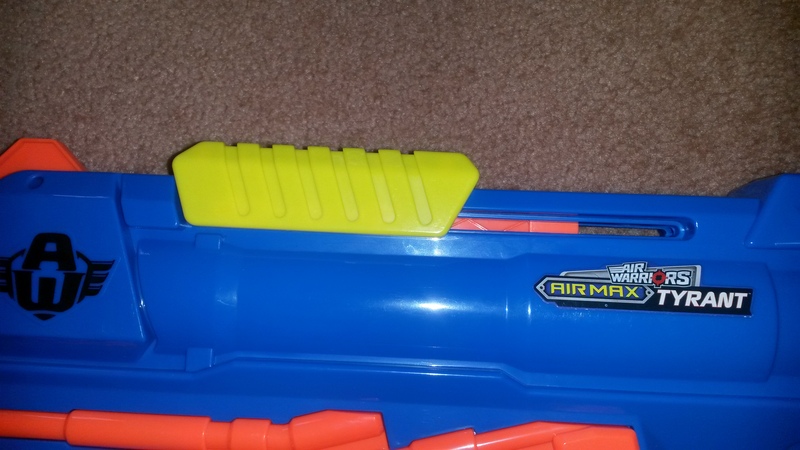 Clip (mag) not fully in. 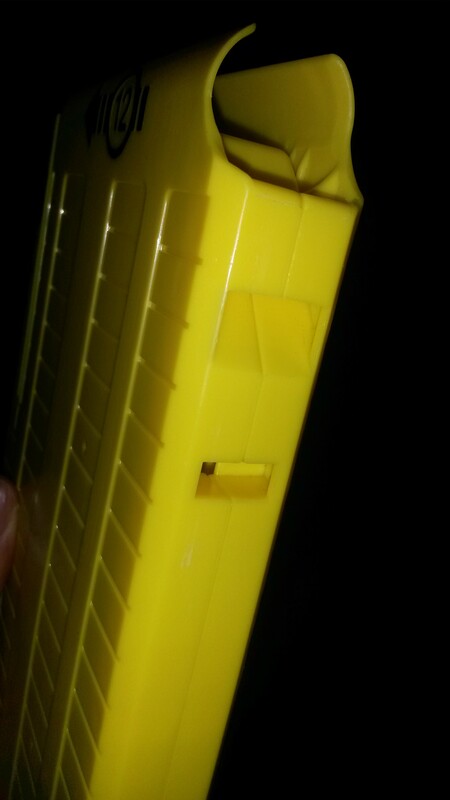 Notches in the back of the clip (mag). 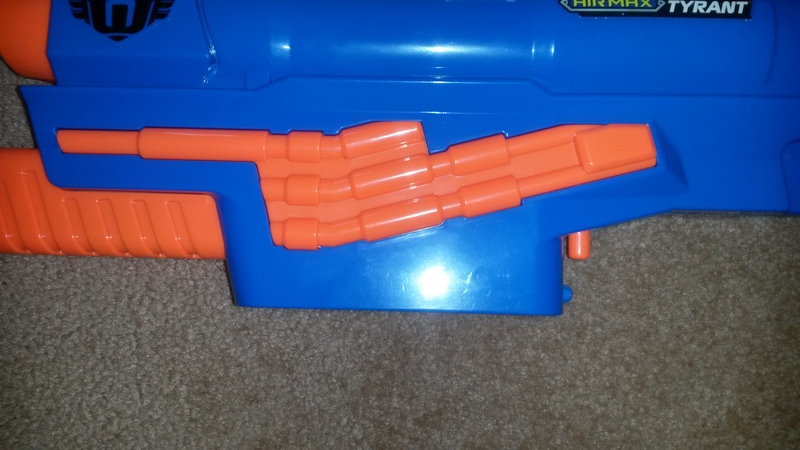 Another odd issue with the Tyrant is that the clip (mag) can stick in a position that feels like it’s inserted in, but actually isn’t. 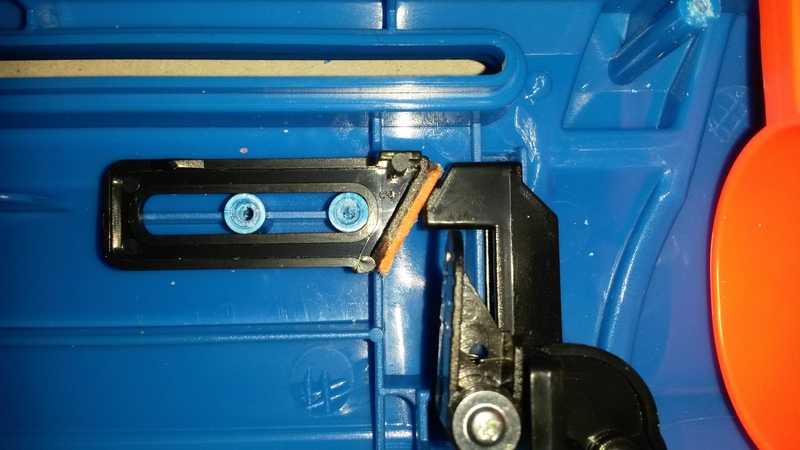 This stems from the clip itself having a notch above the standard clip locking notch. 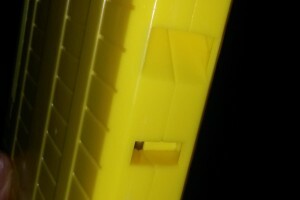 Likewise, if the clip (mag) release is not held for long enough, upon removing the clip it can stick in the same position. 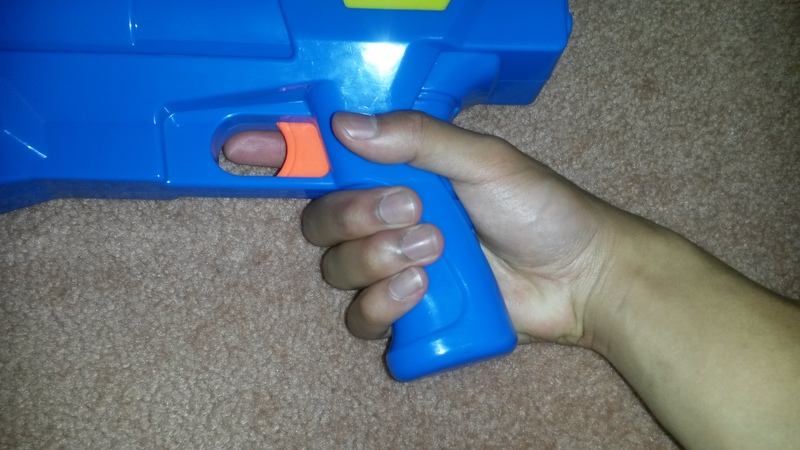 This problem is circumvented by simply holding down the clip release until the clip (mag) is completely in or completely out. 12 Mega clip (mag) next to a Rebelle 12 clip (mag). 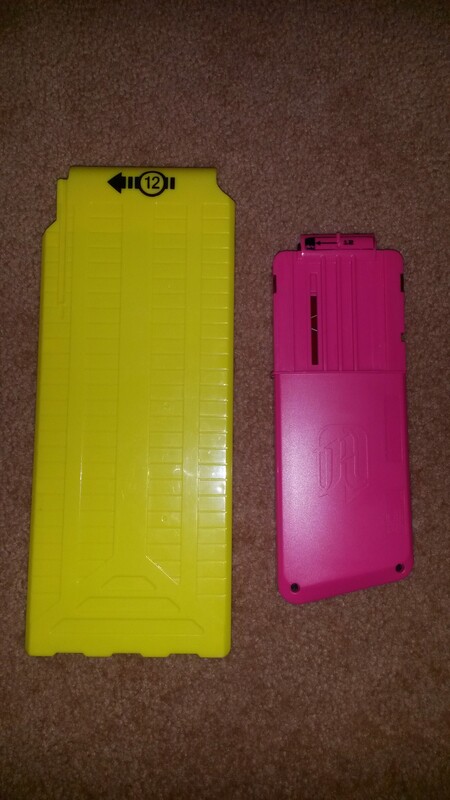 The 12 dart mega clip (mag) is pretty massive, it’s actually comparable in length to an 18 dart clip (mag). 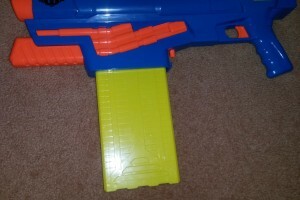 The 12 dart mega clip (mag) is a pretty big deal, it’s the highest capacity Mega thing we currently have, and is twice the capacity of Nerf’s only mega clip (mag). Range-wise a US-spec Tyrant is pretty darn good, I was getting 15-18 metres with suction tipped XL distance darts. 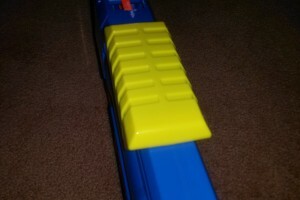 It completely humiliates all of my grey trigger blasters. 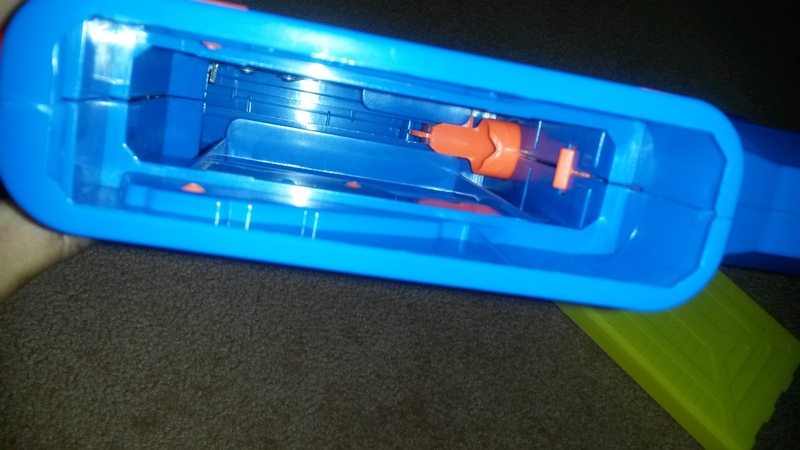 Accuracy was surprisingly not that great from my testing, the suction tipped darts did not always fly straight. 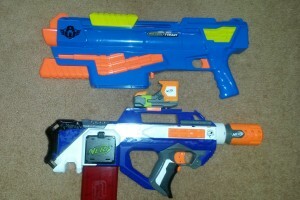 They still did far better than Nerf’s Megas, which like Elites love to veer everywhere. 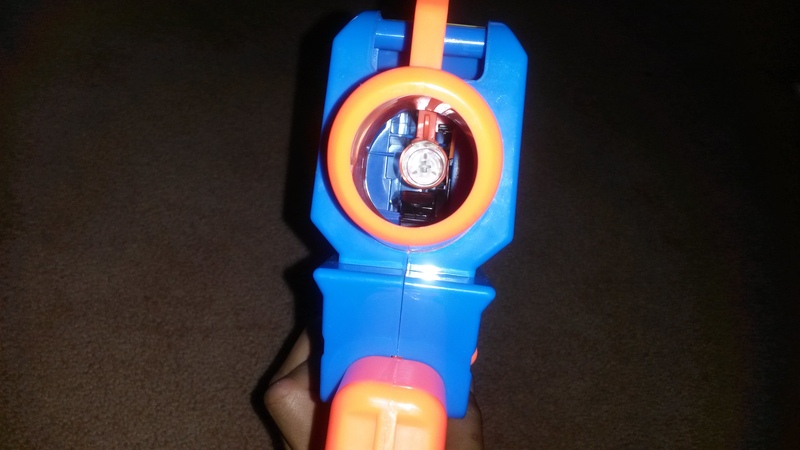 Rate of fire is held back by the dart tooth issue, limited to about 1 dart per second. 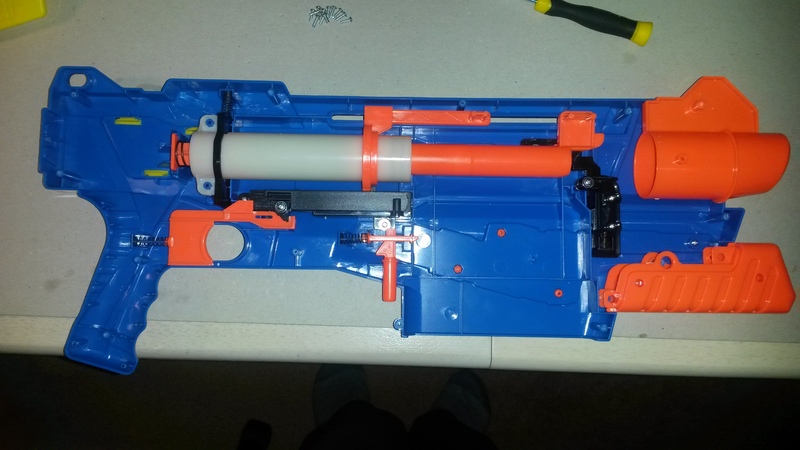 With the dart tooth fixed up, a ROF of about 2dps is possible. 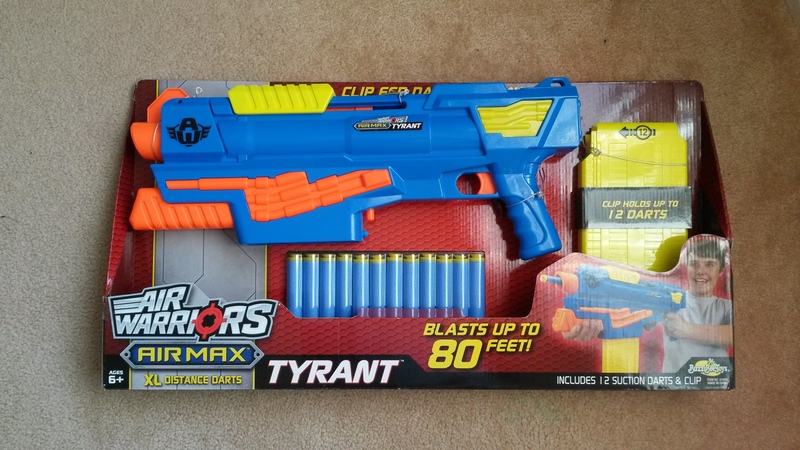 The Tyrant is, simply put, the best Mega primary available. 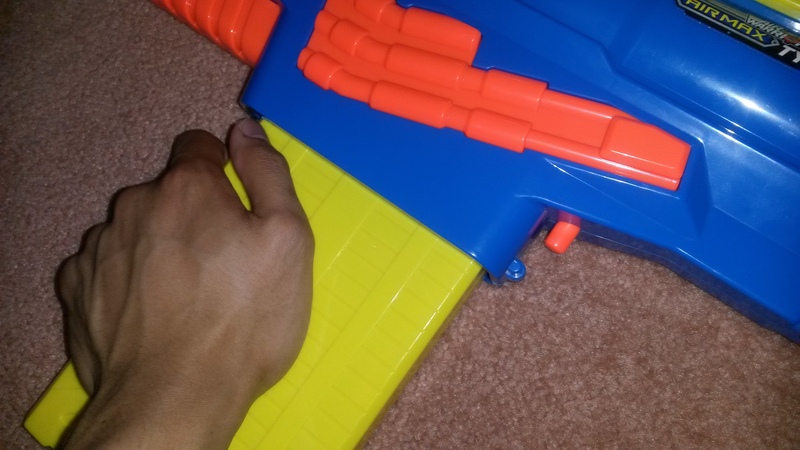 It has a greater capacity than Nerf’s closest competitor, the Rotofury, and with its clip (mag) system is also able to reload much faster (if spare clips [mags] are available). It’s simple and effective, if rather awkward to handle. 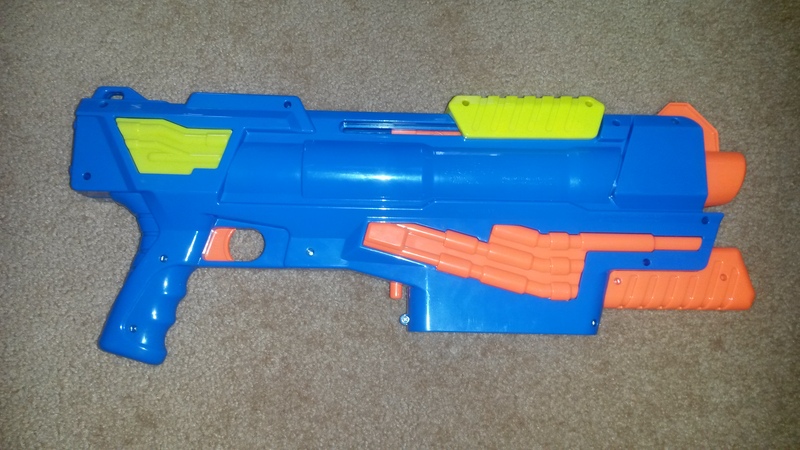 Obviously it’s not something you’d take to go up against modified Rapidstrikes, Retaliators, etc, but for Mega combat, it’s a pretty darn good choice. 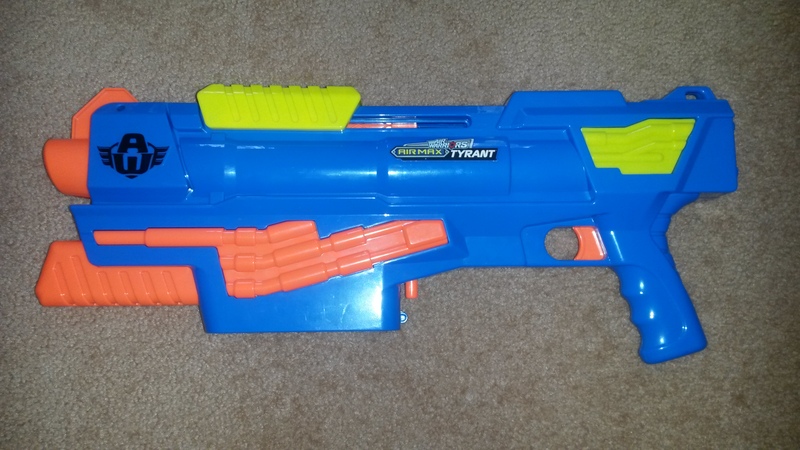 The Tyrant retails for 20USD, which is a pretty good deal. 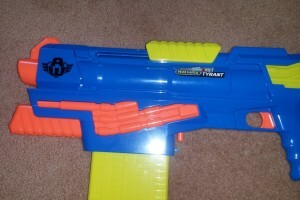 None of Nerf’s Mega blasters get close to the Tyrant for value for money, none of them can even match it in capacity. 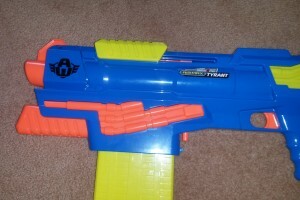 Sure Nerf’s offerings are perhaps more sophisticated, better built and better looking, but nothing so far can outright beat the Tyrant for Mega blasting. If you’re at all into Mega, I heartily recommend the Tyrant as something you should buy, perhaps even multiples of for the spare clips (mags). 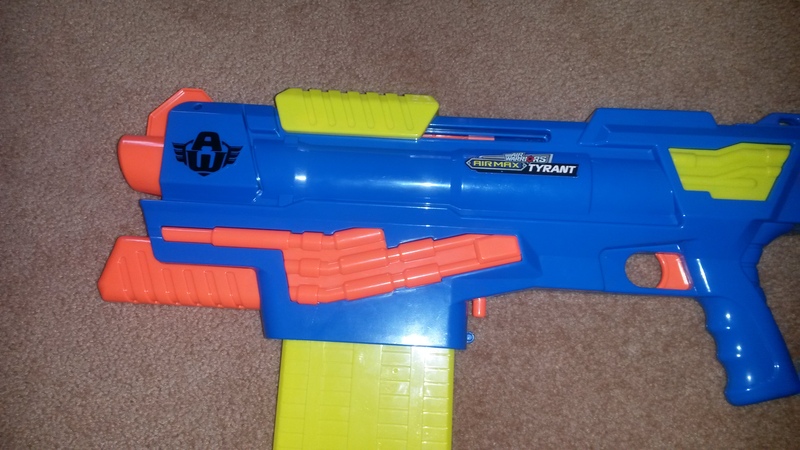 Even if you’re not a Mega fan, I’d recommend giving the Tyrant a closer look. 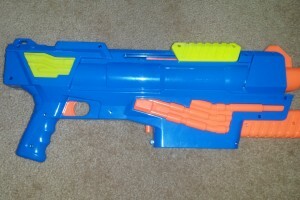 While it’s not the most practical blaster, it’s darn good at blasting and is a good lot of fun. 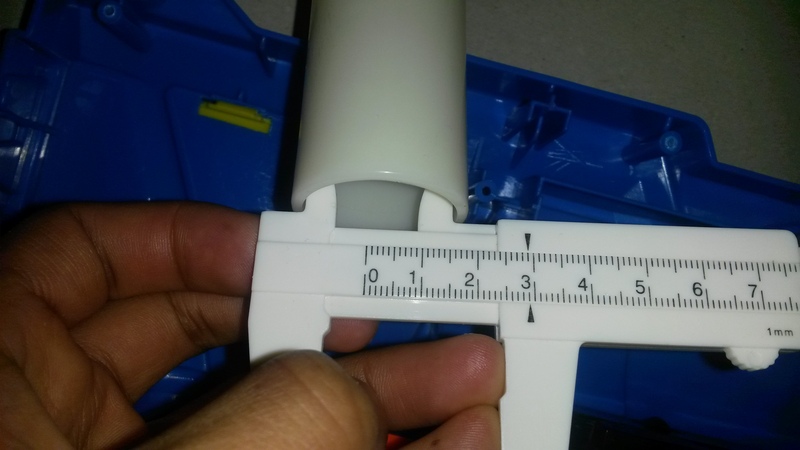 Width of the plunger tube. Draw of the plunger tube. 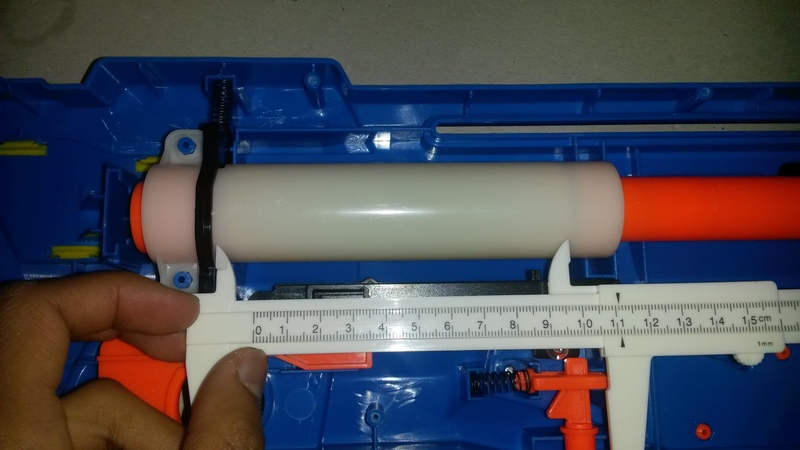 The Tyrant’s internals are reasonably simple, and pack a massive plunger tube. 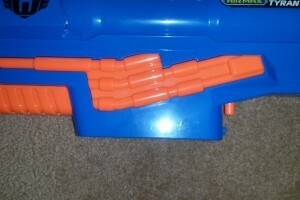 You could easily get a lot more power out of it from extra springs, and if you converted it to fire Elite-sized darts, you’d have a pretty scare powerhouse. However before all that, I’d recommend adding a stock on the back, something this big sorely needs a stock for balance and comfort. 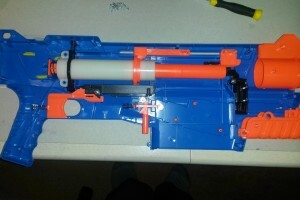 This is my fix for the dart tooth issue. 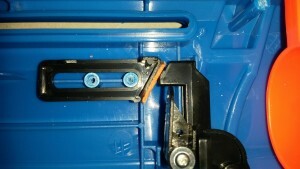 The orange piece is a shim of plastic that causes the dart tooth to retract slightly earlier. I’ve tested it a fair bit and this particular size of shim works really well. 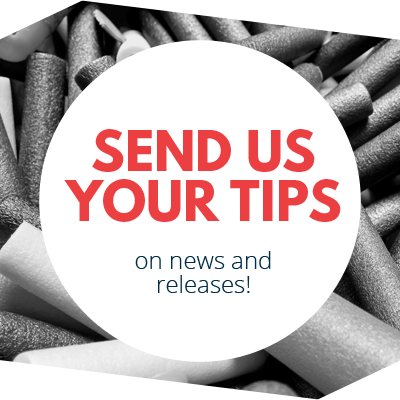 It retracts early enough for a smooth stroke, but late enough that darts are chambered properly. If your Tyrant has the same dart tooth issue, I’d highly recommend doing this. It’s quite easy to do and works really well. 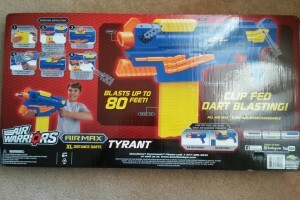 Again, many thanks to Buzz Bee Toys for sending the Tyrant to me for review. 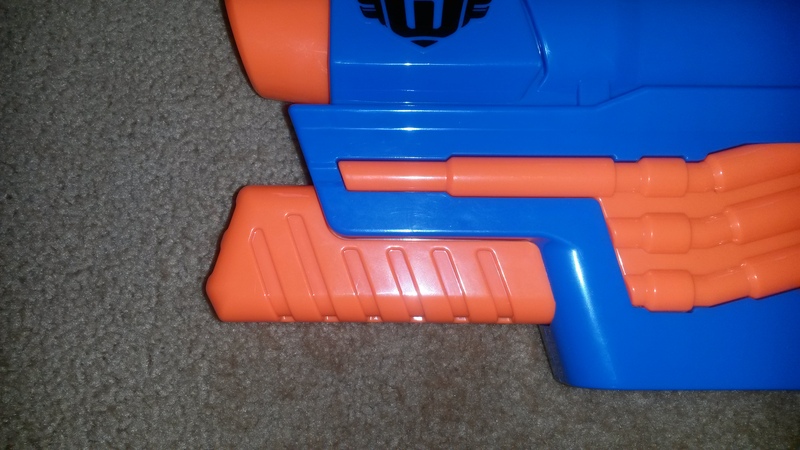 This entry was posted in Dart Blasters, Reviews and tagged air, bee, buzz, max, review, tyrant on December 21, 2015 by Outback Nerf.